"Marley is dead, to begin with." So begins Charles Dickens' classic story A Christmas Carol. It's also the source of the title of local playwright Jeffrey Hatcher's new play about the author, To Begin With, now playing at the Historic Wesley Center in downtown Minneapolis. In it, we learn a little about the man, his writing process, and specifically his book The Life of Our Lord, an adaptation of the Christian gospels. He wrote this book for his children and never intended for it to be published, which it wasn't until 64 years after his death. 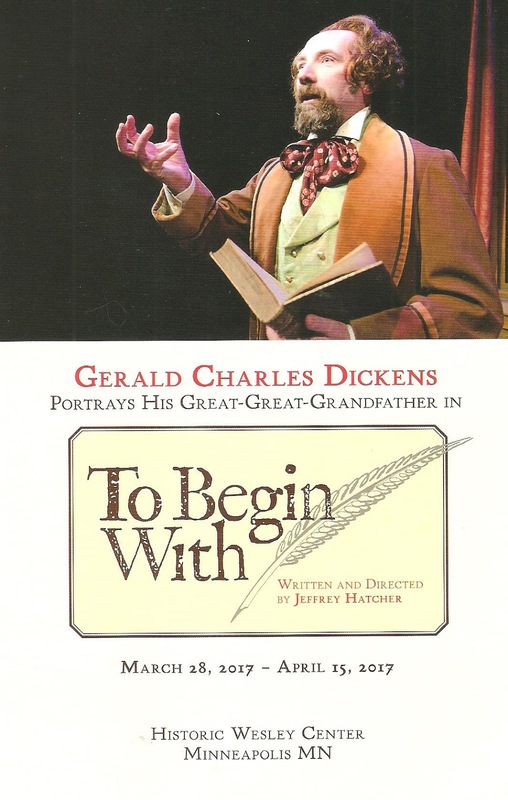 Jeffrey Hatcher imagines the motivation behind this, and as portrayed by Dicken's great-great-grandson Gerald Charles Dickens, paints a lively portrait of an intelligent and witty man dedicated to faith, family, and his work. 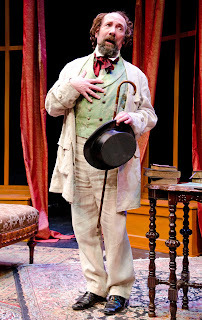 We meet Charles Dickens in his summer home in 1847, and it's quite easy to believe that his great-great-grandson is the man himself, dressed in period appropriate clothes (designed by Nayna Ramey). Charming and personable, speaking Jeffrey Hatcher's smart and funny words, he's quite a wonderful storyteller. For that's really what this play is, one person telling a story to the audience, the most basic form of theater. Dickens tells of an infuriating encounter with his 12-year-old neighbor that inspires him to educate his own children in the life of Jesus. He then decides to perform the work as a play for his children on Christmas Eve, and we get to witness the rehearsal. In it he focuses on the kindness and generosity of Jesus, and hopes that his children will remember that and follow suit. The Wesley Center is a gorgeous old building right next to the convention center in Minneapolis, that I didn't even know existed. It's a beautiful space in which to see theater, especially a piece like this. A former church seems like an appropriate space in which to listen to Charles Dickens tell the story of Jesus. To Begin With is an engaging 90 minutes that lets us get a little closer to the person behind the literary icon. Playing through April 15 (the day before Easter), for those who identify as Christian it might be a nice thing to see this Lenten season. And for those who don't, it's an interesting look at one of England's most famous authors.